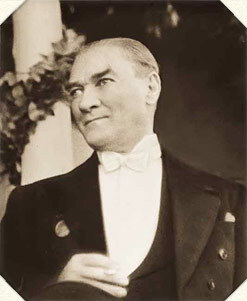 Junus Nadi Bey willingly accepted his proposal. From the con tents of the telegram I shall refer to in a moment, it can be seen that he relied on the information he received from Djemal Pasha, believing it to be true, and on it based his view of the situation. The exchange of telegrams between Junus Nadi Bey and ourselves is very important, because it was an effort to reach at least an apparent understanding between us and the new Cabinet. For this reason, I will give you some particulars about it. 1. There is no reason for looking with displeasure on certain members of the Cabinet because they belonged to Ferid Pasha s. Abuk Pasha took part in overthrowing the latter s Cabinet. 2. Riza Pasha s Government is only a temporary one. It can only hold office until the result of the elections for the legislative body become known. 3. Junus Nadi Bey declared that nothing done by the present Government could leave any doubt that they were favourable to the adoption of all the claims and aims of the nation and were fully resolved to realise them. 4. He ended by assuring us that people like Djemal Pasha and Abuk Pasha must be regarded without any hesitation as guarantors and delegates of the national organisation within the Cabinet. The next subject Junus Nadi Bey touched upon was quite personal. Sharing our feelings entirely in this regard, he said: “I venture to advise you to act with moderation/ and he developed his point of view that it would be very important to prevent the good effects produced by the success of the national cause appearing in the eyes of certain persons as being tainted with a spirit of revenge. Sivas, 6 th October, 1919. To Junus Nadi Bey Effendi. Have you studied the essential, as well as the minor, proposals which the Representative Committee has laid before the Grand Vizier, and His Highness s answer particularly the last paragraphs of it? Judging from your last remarks, we have come to the conclusion that you have never set eyes on these documents and that you have merely been told of their contents by people who have not completely understood the sincerity of my proposals. For this reason, we find it very difficult to enter into an exchange of opinions with you concerning the main point of the question. We will give you some of our opinions in their proper order and throw a little light on some of your remarks, which seem to represent your own personal opinion. We also thought that there would soon be harmony between the new Cabinet and our national movement. The cause of the delay is not to be attributed to our side, but to the hesitating and vacillating attitude the new Cabinet has taken up during the last four days. We have not even yet been told by them that any difference of opinion exists between them and ourselves. Without casting doubt on the honour of the former Ministers who have now joined this Cab inet it is still a fact that, consciously or unconsciously, they have been taking part in the treacherous actions of the late Cabinet and this is an important point that we must be careful not to lose sight of . wHire notmmindful of the part which Abuk Pasha played in the overthrow of the last Cabinet. But we also know very well what power really brought about this result. .
Our aim is not, as you seem to think, to look upon this Govern ment as a temporary one. In all that affects the vital interests of the nation, everything that does not emanate from us has no importance whatever in our eyes. We are among those who condemn the weak-kneed policy that forces us to proceed on the lines indicated in empty speeches which are antagonistic to our ideas. We know the internal and external situation very intimately. Our standpoint has not been adopted haphazard. Our method of procedure is based on complex considerations, on a firm foundation, on the true force of the nation as a whole, consisting of a regular organisation and the firm will of the nation. The nation is resolutely determined that its full sovereignty shall be recognised by the whole world. We have taken the necessary steps everywhere to ensure this. We demand that the present Government shall accept the national claims and shall do everything in agreement with us to achieve success. If it will not do this, it will be unable to govern the nation. We do not know about Abuk Pasha, but with regard to Djemal Pasha we expect only one thing from him, namely, that he shall be the represen tative of our national organisation. We hoped that as soon as he became a Minister he would keep in touch with us, so that we would be well informed as to the actual state of affairs, and then act as the intermediary to bring the ideas of the Government and those of the national organisation into agreement. But now it seemed as though he were trying to avoid coming into close touch with us. The proposals and demands which we addressed to the new Cab inet had in no way the character of personal and arbitrary opinions. They were the essence of all the proposals collated by our Represen tative Committee to avoid placing the Cabinet in a difficult position. These proposals had been put forward by all the vilayets and auto nomous sanjaks and the places under their administration, the five commanders of Army Corps and all the heads of the Civil Adminis tration who are faithful to the national organisation. They do not suggest any of the doubts, such as those you anticipate and speak about. If the Government will sincerely and seriously enter into communi cation with us for the purpose of exchanging opinions with us, nothing else will be left for us to do but to fix the time when our proposals and demands will be fulfilled and the form they will take. The concluding paragraphs of the Grand Vizier s telegraphic reply to our Representative Committee, on the 4 th October, deserves very careful attention. There is no doubt that there can be no unity so long as the con ception exists that our lawful national organisation and their leader are illegitimate and unlawful. If the manifesto, the publication of which you announce will take place to-day, will for any reason or in any manner speak disparagingly about our national organisation and our national movement, if only by some formal expression, we shall immediately come to the con clusion that there will be no possibility of our arriving at any under standing. Moreover, we shall not allow the Government s manifesto to be distributed anywhere before the Government has come to a definite understanding with the Representative Committee. Its publication will be limited to decorating the walls of Constantinople. Our Representative Committee is a national and legitimate body elected by the General Assemblies of Erzerum and Sivas, consisting of representatives chosen by the free vote of the nation in all the vilayets and autonomous sanjaks. It is evident that the Government will strengthen its position and its authority by keeping in close connection and sincere relations with our Committee. It is equally clear that the interests of the country and the nation will suffer if they follow different leaders. We wish to avoid what we have experienced before, namely, that certain persons whom we are convinced will be useful to the country and the nation in the present Cabinet, should become the victims of the tactics employed by the Cabinet which aim at elbowing them, one by one, out of their offices. The Representative Committee assembled at Sivas is prepared to enter into sincere and direct relations with the Government. It does not possess the power of delegating their authority to anyone else. If a perfect understanding with the Government can be reached, then we can consider taking further steps that will facilitate and firmly establish our unity. In short, to put an end to the present state of confusion as quickly as possible, the Government must publish a manifesto in terms similar to those we have proposed and demanded, which will not consist merely of empty words, but will be expressed in sincere language. In addition to this, the Grand Vizier must give us a straightforward answer, in which he will declare that he has favourably received our other proposals and that they will be carried out. But as our telegrams and manifestos have been controlled, stolen, and waylaid hitherto by RefikHalidBey, it seems very strange indeed to us to hear anybody speak about the sincerity of the Government. If the Government persists, even for a few days longer, in their vacillating attitude, it will be entirely their own fault if the nation fails to have the confidence in them which so far it has not had time to experience. We are receiving telegrams from all parts of the country asking us whether confidence can be placed in the new Government or not. I assure you, dear brother, of my esteem. — , , . From the communications that passed between Junus Nadi Bey and ourselves and the information I gave him, he was able to get a good idea of the real position. He did not consider it necessary to continue the subject. On the contrary, he was apparently trying to advise the new Government, and Djemal Pasha in particular, what was the right thing for them to do. In fact, as I shall explain to you, some kind of understanding perhaps, only an apparent one seemed to be arrived at. 1. The Cabinet is in accord with you and recognises that the will of the nation is sovereign. It is only afraid that it will be looked upon as a Government of revenge. It shares your opinion that those who are guilty must be punished in the manner prescribed by law. 2. It pledges itself unreservedly to prevent any further punishments being inflicted on those Valis who have been injured in their rights, and indemnify them for what they have suffered; to select and appoint worthy and suitable persons to fill Government offices; to restore dignity and order in the Army. 3. It will rely on the national will and the Representative Com mittee to restore the authority and prestige of the State in the eyes of foreign countries. 4. In my position as the delegate of the Representative Committee, I declare to you in full sincerity and with deep esteem that the Cabinet is desirous that the Representative Committee should support it, but without assuming supreme authority in matters relating to internal affairs or foreign policy. 5. I pledge myself personally to the effect that all acts directed against the national will shall cease; the only point that remains open for discussion is the fixing of the time and the manner of carrying out the details, about which I feel sure we shall easily come to an agreement. So that we shall be able to work together hand in hand at once to realise our aim, which is the liberation of our country, I earnestly beg you not to insist on details but grant me your support. We sent the following friendly and sincere reply to this telegram. Telegram in cipher. Sivas, 7 m October, 1919. To His Excellency Djemal Pasha, Minister of War. 1. We thank the Cabinet in the name of the nation for having declared themselves ready to accept the sovereignty of the national will in complete accord and unity with us. We, also, would feel great anxiety if the Cabinet, the Representative Committee and the whole of the national organisation were to be suspected of pursuing a policy of revenge. On this point we are perfectly in harmony with the Cabinet; also in regard to the necessity of punishing those who are accused before the law. 2. We also thank you specially for the conclusion contained in the second point. For the following reason, we had thought it necessary in our preceding telegram to enter into details about this question. We were afraid that if certain Valis and commanding officers who were deprived of office by the people on account of their opposition to the national movement and the national activities, were to be reinstated even temporarily on the ground of observing due forms, they would not return to their duties, and this would injure the authority of the Government, who thereby would lose prestige. 4. We declare in all good faith and assure you that, in return for the sincerity and earnestness shown by the Cabinet, the Represen tative Committee will never assume the position of being a supreme authority, either in the country itself or in regard to foreign relations. On the contrary, the Committee consider that it is their duty, for the sake of the country and the nation, to support and uphold the authority of the Government within the limits of the principles adopted by common consent. We desire to convey the solemn assurance that we make no reservation whatever in this matter. That, in accordance with Art. 8 of our regulations, Your Ex cellency is a member of the Cabinet as the delegate of our Reprentative Committee, is a fact that has given us the greatest satisfaction, all the more so, because it ensures perfect harmony between the actions and decisions of both parties. When in future, in all the questions pending between the Cabinet and our national organisation, harmony and mutual interpretation will be arrived at, there will, naturally, be no further interruption in our communication with one another. As, however, the Representative Committee must necessarily still keep in close touch with the organising centres of our movement throughout Anatolia and Rumelia, we urgently request that we may be permitted to carry on our telegraphic communication in an official way as we have hitherto been doing. We would like to take this opportunity, also, of putting the following matter before you: As it is absolutely necessary for the maintenance of the authority of the Government that, from the moment it begins to issue its orders, it shall not encounter any opposition, we request you to grant us a delay of 48 hours to enable the Committee to transmit the necessary instructions to the principal places. We earnestly request you to send us in confidence, before its publication, a copy of the manifesto that the Cabinet is going to issue, and which we had asked for, so that the instructions sent out by the Representative Committee may be founded on it and thus we may inspire the nation with confidence. After we have received it we shall immediately send you a copy of the address which we shall present to His Majesty expressing our thanks, as well as a copy of the manifesto we shall address to the nation. Any remarks that the Cabinet may desire to make about it will be taken into our respectful consideration. Will you be good enough to inform us what particular idea inspired you when you drafted the new electoral law, so that we shall be able to make our comments on it. 5. Having arrived at a complete agreement on the main points, no doubt can exist any longer as to Your Excellency s sincerity and that of your honourable colleagues, and it is quite natural that perfect harmony should exist between us concerning the details. My colleagues and I beg you to feel assured that we shall work with all our strength, in all sincerity and with all possible energy, to assist the work carried on by Your Excellency and the Cabinet of which you are a member, so that it will be crowned with success and lead to our country attaining its freedom as soon as possible. I send you our greetings and the esteem of all my colleagues, who are present with me here. (Signed) Mustapha Kemal. But, as we had been given to understand that the Government did not want TIS to see their manifesto before it was published, we published our own manifesto to the nation without consulting the Government, and the same thing applies to the telegram we addressed to the Sultan. The telegram that we sent to the Sultan expressed our thanks on behalf of the nation. (Documents 138, 139.) I would like to divert your attention here for a moment to tell you that in trying to enforce the universal will of the nation upon the whole of the country, our Committee was at the same time in direct communication with Smyrna, which was occupied by the enemy. On the 7 th October, while we were engaged in impressing our opinions on Ali Riza s Cabinet, we also sent the following telegram to Smyrna. Urgent. Sivas, 7 th October, 1919. To the Vilayet of Smyrna. We were undoubtedly very well informed about what was happen ing at Smyrna, about its VaH and the general conditions prevailing there. Even if it was doubtful whether they had received our in structions, it was certainly quite impossible that they had been obeyed. But at the same time we thought it just as well to let our enemies see that there was some power and authority watching over the destiny of the whole country and which refused to recognise the occupation. Having touched superficially on the facts and events of that time, let me explain to you another circumstance.